Create with Gwen: NEW from Stampin' Up! WOW, Stampin’ Up! continues to impress me! 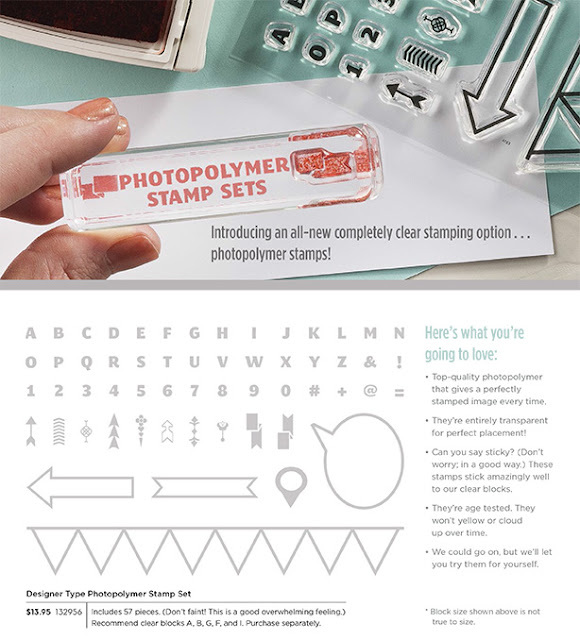 NOW offering PHOTOPOLYMER STAMP SET! and YES, I ordered it! Photopolymer stamps will be offered on a trial basis! Like them? More maybe coming over the next few months! • They're entirely transparent for perfect placement every time! • They are durable. The photopolymer material is designed to last. • Can you say sticky? (Don't worry; in a good way.) These stamps stick amazingly well to our clear blocks. • They're age tested. They won't yellow or cloud up over time. • They use FDA, food-safe material. How far can you stretch your stamping creativity? • Available beginning March 1, 2013. • Not available in wood-mount or clear-mount. • All photopolymer will be packaged in cello bag w/insert, but don't forget you can store them in our clear cases! …and of course SALE-A-BRATION FREEBIES!